Indian Air Force Group C Civilian Recruitment 2019 (भारतीय वायु सेना भर्ती 2019- ग्रुप सी नागरिक रिक्ति नोटिफिकेशन) Indian Air Force has announced the Group C Civilian Vacancy Notification inviting candidates to fill up the various Group C posts. The well-skilled and eligible candidates who want to get Indian Air Force Jobs can apply for Indian Air Force Group C Civilian Application Form 2019 within 30 days from the last date of the publication of this advertisement in employment newspaper. Candidates must download the application form from here with full details. In terms of more details such as age limit, pay scale, eligibility, Selection & Application process, etc. go through the Indian Air Force Group C Notification mentioned in the article below. 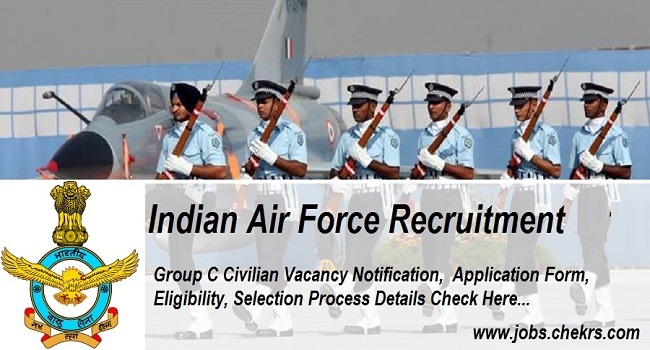 Latest Update: Indian Air Force is going to release the recruitment 2019 notification for various Group C Civilian Posts. Interested aspirants can fill the online application form before the last date. Indian Air Force releases various recruitment notifications to fulfill the vacant seats every year. Recently, Indian Air Force Announced the IAF Group C Civilian Recruitment 2019 Notification for the Storekeeper, fireman, tailor, Multitasking Staff, etc. posts. Eligible applicants who are interested in IAF Group C Vacancy can go through the complete details which are given here. Firstly applicants need to check their eligibility for the Group C civilian vacancy from here then apply for the application form. Candidates can directly download the application form on the official website and can get the download link from here which is given below. Applicants download the application form and fill the required details and attached the qualification, caste, etc. certificates and post on or before the Last Date. Applicants who are applying for Indian Air force Group C Jobs can check the eligibility criteria for the various posts from here. The graduate of a recognized University or equivalent with good academic marks. The education qualification is different for the various posts so you will have to read the official notification which is given below. For Steno-II & Fireman Post: the minimum age should be 18 years and maximum age should be 27 years. For Others Posts: the minimum age should be 18 years and maximum age should be 25 years. Pay Scale is Rs. 5200- 20,200/- + Grade Pay is different for different posts you can check the notification for Salary Details. Log into the official website of Indian Air Force. Search the Recruitment Section and click on the Group C Civilian Recruitment Link. A notification pdf will be open and read it. Download the application form and fill it with full details. Currently, the Indian Air Force (IAF) has published Group C recruitment notifications. You can get the upcoming notifications in our portal www.jobs.chekrs.com. Therefore the skilled candidates interested for Defence Jobs can apply online before last date. In regards to any queries or reviews in terms of IAF Group C Recruitments 2019, we welcome your valuable comments in the commenting section below. Our team will solve your query in a short while.